Hey Animovie, I saw a bunch of screenshots of the movie on your Tumblr. Do you have the movie digitally? If so how can I get it? I got this screenshot from Animovie's tumblr. I guess we can all agree this screenshot is full of references. 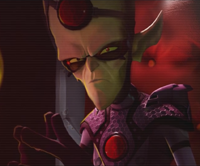 From left to right there is the Hologuise, the Protopet, Lawerence blueprint (which suggests that he was not created yet and that he got designed by Nefarious or Elaris), a note with "Qwark's Password" which cannot be seen, some desings of the Helipack, the Thrusterpack and the Hydropack, the Zoni, the note with a heart that says "STIG", Skidd McMarx and lastly a note with a pie and the number 3.14. Dang Handem, you beat me to it! I thought I was one of the first people to spot that pic of Lawrence in the style of the Vitruvian Man in the shadows. There is also a pic of the groovitron and robots dancing to it above the image of Skidd and the darts in the poster of Neffie are mini-warmonger missiles. I guess to return the compliment from a couple of months ago, good eye! Thank you. One thing that I feel weird about is that Lawrence has not been created yet but in the vid comics he was with Nefarious since he was a squishy. Also, didn't notice these darts but they look really funny! Good work! "I guess to return the compliment from a couple of months ago, good eye!" Could you please remind me what are you refering? Sure, so I thought it would be more than fitting if I returned the complement you gave me on my first post here: this one back in March. I wonder if Ratchet went to the gift shop. What would he buy? How about a Qwark statue stuck in the pumps?